While HD Tach's sequential read performance is more of a 'drag race' approach to evaluating storage performance, it still provides valuable insight into how good a drive is compared to the next. 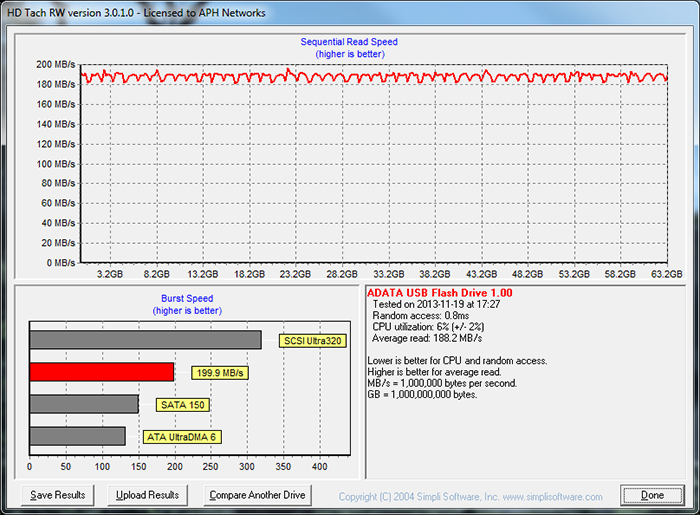 From that above, I was able to pull a very good 188.2MB/s sequential read speed from the ADATA DashDrive Elite UE700 64GB in a flat line. Of course, this is not the fastest we have seen from a USB 3.0 flash device, but pretty darn speedy nonetheless. Just for comparison, Kingston's DataTraveler Ultimate 3.0 G3 32GB delivered 176.0MB/s in the same test, while the HyperX 64GB and Supersonic Magnum 64GB pulled 231.1MB/s and 231.8MB/s, respectively. This means it is slightly faster than the DT Ultimate in this regard, but slower than the Kingston and Patriot performance drives. For what it's worth, this is probably not going to be indicative of real life performance by any means, but at the end of the day, these numbers are certainly something we would not even have dreamed of three or four years ago. posted 16 hours and 49 minutes ago, with 9 posts. posted 21 hours and 18 minutes ago, with 9 posts.